Zuri Berry is a sports writer and producer for Boston.com, covering the New England Patriots. He's a San Francisco native and has lived in Boston since 2009. DETROIT -- As the Bruins' defensive prowess continues to make its mark on the Detroit Red Wings in the Stanley Cup playoffs, the team's top forward, Patrice Bergeron, was recognized for his own contribution to Boston's intimidating defense. 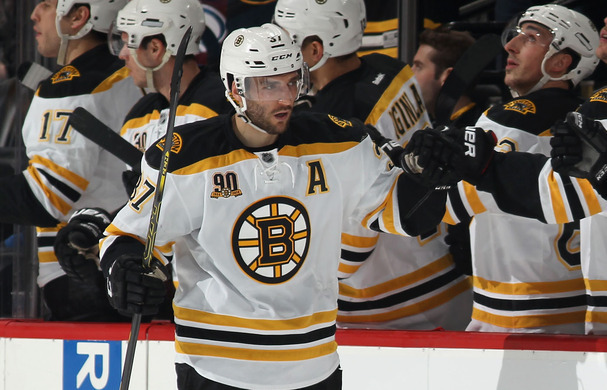 "It�s definitely a huge honor," Bergeron said. "It goes to the help of all my teammates. There�s no individual awards that don�t go with the help of all your teammates." Bergeron is joined by Chicago Blackhawks forward Jonathan Toews and Los Angeles Kings forward Anze Kopitar as finalists. Bergeron won the award in 2011-12 and this is his third straight year he was named a finalist. This season, Bergeron led the NHL in faceoff wins with 1,015 and finished third in faceoff percentage at 58.6 percent. He also wound up second in the league in plus/minus rating (+38), trailing only his buddy David Krejci (+39). "I think I�ve always been taught to play the game that way, both sides of the ice," Bergeron said. "Growing up playing juniors, my coach put a lot of emphasis on that." "That�s the way I want to play the game and that�s the way I grew up playing it," he said. "So it does feel natural for me to play both sides of the ice." If nothing else, it's a nice attaboy for Bergeron, who has battled both Detroit's Pavel Datsyuk and a nasty stomach bug in the Bruins' first round series.